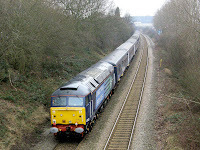 Today's Valentine special (the "Stobart Pullman"), runs through a gloomy cold Aldridge en route Cadbury's Bournville, headed by DRS loco 47712 with 47802 bringing up the rear. Note the non-original oval buffers fitted to 47802. 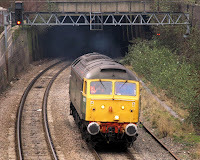 A while later I caught 47812 (D1916) running light through Walsall on a route-learner returning to Derby via the Cannock Line and Stoke. Someone was in the know! 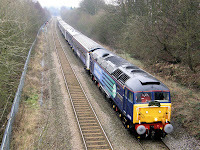 Very nice photos, especially 47812 heading for Ryecroft, if only the two slow lines that were on the right had not been lifted in '88. The framework on the gantry above the loco once supported WL69 signal for the up slow, nowadays WL68 on the left has the gantry all to itself. Bit of a rush job for the charter, didn't have my SLR camera with me ! As you say it would be great to have four running lines up to Ryecroft again, don't suppose the current traffic levels deamnd such a thing though. Believe me those two slow lines would come in handy now. If those were relaid and the down fast restored as a through line in the tunnel the extra capacity would be a big plus. You did very well with those charter pics! Plenty of beastly action amongst a tsunami of sheds. Nice shots mate.